It’s no secret that the Google Search Engine Results Page (SERP) of today is different from the Google SERP page of 10 years ago. When we used Google to search for pizza restaurants in Chicago back in 2008, Google would give us a long list of organic results to click on to find the pizza of your dreams. 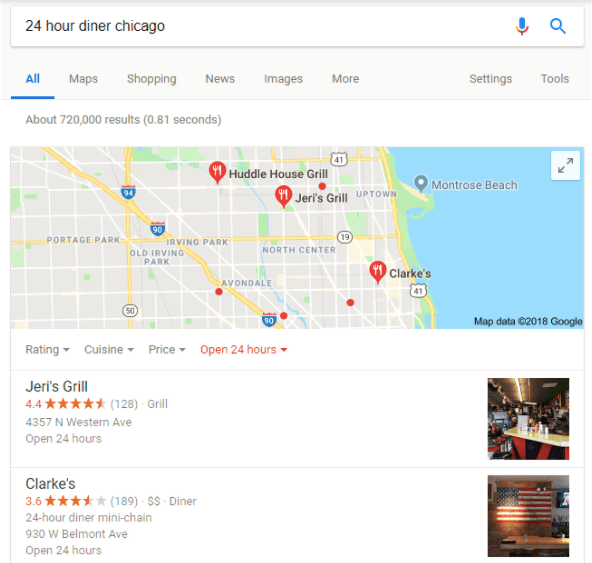 If you use Google to search for that perfect pizza nowadays, it’s commonplace for a map of pizza restaurants in Chicago to show up before the organic search results. That map–your gateway to pizza–is a SERP feature, and it could be a key driver for growing your business and establishing authority in your industry. There are over 16 different kinds of SERP features you can use when you want to help your business stand out from the crowd in a Google search. Unlike organic results, SERP features make it easier for people to find helpful results or gather more information about a business without having to click on a blue link or navigate to another one of the tabs at the top. When you provide potential customers with several different types of relevant micro-information they can access quickly, you’re taking that first step toward increasing your business visibility, customer trust, and future sales. This is especially critical for small businesses that are working to drive traffic to their websites and build brand awareness. For established brands, this is a chance to cement your reputation as industry leaders. Let’s take a look at a few of the most common SERP features and discuss their value and what they can do for your business. What SERP Features can I use for my Business? With over 16 options to choose from, you might be wondering if you should be using all of the SERP features or just a few of them. For all intents and purposes, the specific SERP features you use varies from industry to industry, but there are 3 key SERP features that businesses from all industries can use to enhance their search presence and drive traffic to their sites. The local 3 pack shows location-based results based on your potential customer’s geographic location and the terms they used in their Google search query. The local 3 pack includes the names, addresses, opening hours, and phone numbers of local businesses. This SERP Feature works best for local food, retail and service-based businesses with one or multiple locations. The local pack is part of Local SEO, so in order to be featured in a search result, you need to optimize your website’s content for local search, get your business listed in local directories like Yelp, and create a Google My Business page. Knowledge panels are the cards that typically show up on the right side of a SERP and provides small bits of structured information for users looking for facts data about an organization, person, product, or topic. 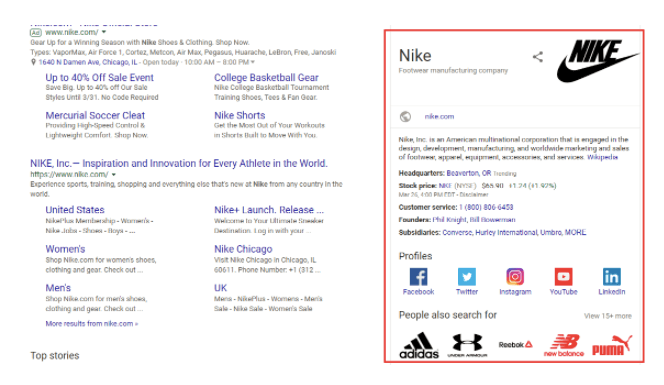 So, if we were to use Google to search for Nike, the knowledge panel on the righthand side of the SERP would give us a quick overview of the company’s history, tell us who founded the company, tell us where we can find their headquarters, display their subsidiaries, and provide us with links to their social media profiles. It would also provide links to websites where we can get more detailed information on our query. While the knowledge panel is great for providing quick tidbits of information, it can also impact your company website’s link clickthroughs at the same time if you provide your users with all the information they need in the knowledge panel. The best way to simultaneously maintain organic clickthroughs and leverage the knowledge panel is to leverage your knowledge panel for branded keywords (e.g., Nike) and providing quick bytes of information so customers can get key facts about your company and then click through to your website. To leverage this SERP Feature, you need to optimize your website content to provide answers for potential informational searches related to your company website’s key focus. You also need to make sure your website ranks at the top of SERPs or at least on the first page if you want to get featured in a Knowledge Graph. Creating a Wikipedia page about your company can also help your company website get featured in a Knowledge Graph. Local sitelinks may be one of the handiest SERP features you can use to help users navigate to your website. A “sitelink” is an extra link that shows up under a search result, and they make it easy for people to retrieve the exact information they need from you, spread traffic throughout your website, and lower your website’s bounce rates. 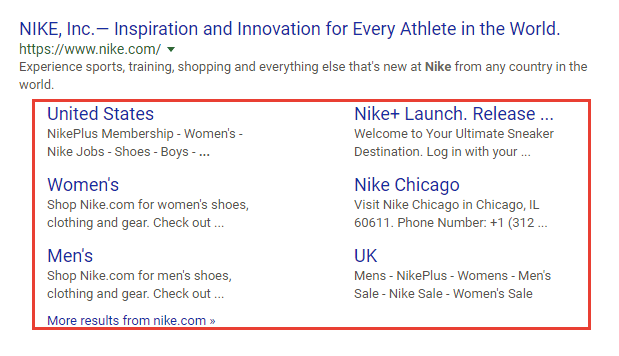 Sitelinks only appear when someone searches for your brand or domain name, when a customer is looking for a navigational item, or uses your brand keywords in a search. When you have sitelinks, your result has more visibility on the page and a higher chance at gaining more of the visitor traffic than the other page results.